The DigiTech RP55 Multi-FX Pedal lets you add several different effects to your guitar. You can conveniently add Reverb, Delay, Chorus and more with this pedal. DigiTech utilizes AudioDNA DSP processor on the RP55 to ensure the pedal's amps and effects are of highest quality. The 24bit A/D/A conversion guarantees that no frequency response is lost between the outputs and inputs. Plus, the built-in chromatic tuner helps you fine-tune your guitar to the way you desire. Dimensions (LxWxH): 5.65 x 6.5 x 2.5"
The 9V Power Supply ensures the correct amount of power transmitted to your electronic devices. It features an extra-long 10-feet (3m) cable that and met UL 5 safety standards. This power supply powers most effects pedals from DigiTech including RP55, JAMMAN, DROP, FREQOUT, POLARA, TRIO+, and FS3X. It can also be used with tip negative keyboards or other electronic devices that have similar amp requirements and voltage. 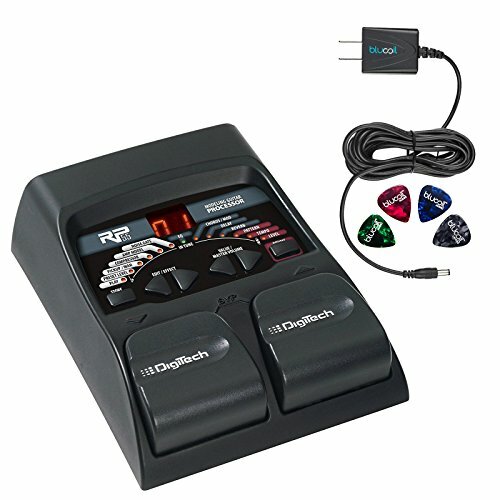 Grab this awesome Digitech bundle today and receive 4 additional Blucoil Guitar Picks! USES 8 FX AT THE SAME TIME - The DigiTech RP55 Multi-FX Pedal features 20 high-quality effects allows, eight of these, you can use simultaneously. FINE-TUNE YOUR GUITARS - This unit includes a built-in Chromatic Tuner that lets you do standard tuning to your string instrument. It also comes with 30 patterns of drum machine. PRODUCES STUDIO-CLASS AMPS AND EFFECTS - This pedal uses DigiTech's renown AudioDNA DSP processor chip. It delivers 24bit A/D/A conversion to ensure that no frequency response lost between the outputs and inputs. PROVIDES 2 FOOTSWITCHES - You can use one of the footswitches to access the built-in tuner, select a preset, or bypass the RP55 pedal. INCLUDES - DigiTech RP55 Multi-FX Pedal. Blucoil 9V 670mA Power Supply with US Plug (Tip Negative Center). 4 Blucoil Guitar Picks.